Donald Trump is like an anteater whose tongue is capable of extending so deep into the American psyche that it can stir up entire nests of cherished beliefs, fantasies and phobias. Although most rational people dismiss him as a serious contender for the highest political office in the world, his current lead in the Republican candidate polling obliges everyone to sit up and take notice. But isn’t this a perverse aspect of our human nature? We know in our hearts that an elephant can’t ride a unicycle up a staircase. At some point, we know he’s going to lose his balance. We’re watching, in horror, yes, that something so circus-like could unfold in the world’s greatest democracy, but we’re also watching in anticipation of a delightfully giant SPLAT at the end of this. High drama and high comedy can go hand in hand, and apparently this is what The Donald, albeit unconsciously, seems to do best. For anyone who’s been living in a Tibetan cave for the past 40 years, here’s all you need to know about Donald Trump. His father was a New York real estate mogul, whose business Trump took control of in 1971. 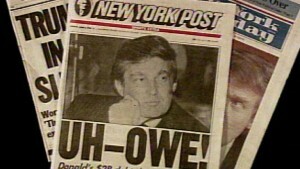 He made his fortune in Manhattan real estate in the 70s and 80s, then lost most of it in the 90s, forcing a fire sale of assets that brought him to the brink of personal bankruptcy. But he bounced back in the late 90s with more real estate projects and went on to even greater heights, relentlessly building the Trump brand. 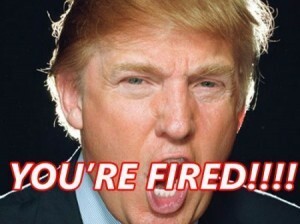 Aside from forays into sports franchises, beauty pageants and other diversions, his genuine fame came in 2003 with his reality show The Apprentice and its now-famous tag-line, “You’re fired!” All along, however, like a child with ADHD and never quite enough toys, he’s flirted with politics. He floated the idea of running for president in 1988, 2004, and 2012, and for governor of New York in 2006 and 2014, but never entered any of those races. 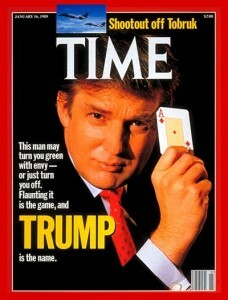 Now, however, he seems to have sensed the time is right for him to fulfill the American dream. And inadvertently, everyone else’s nightmare. 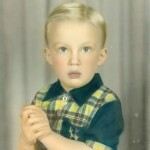 As for Trump, he was born at 10:54 AM on June 14, 1946, Jamaica, within the Queens borough of New York. Raja Yoga is formed when a trikona lord joins a node in a kendra, or a kendra lord joins a node in a trikona house. Here, lagnesh Sun functioning as a trikona lord joins Rahu in the 10th. The Sun has dig bala and Rahu is debilitated, while both are aspected by Jupiter. Neecha Bhanga Raja Yoga arises from a debilitated Moon in the 4th. Its first source of relief: Moon is aspected by its dispositor Mars. Second source of relief: its dispositor Mars is in a kendra. Third source of (arguable) relief: the Moon is associated with angular Ketu exalted in Scorpio. The fourth source of relief is unavailable: Venus, lord of the Moon’s exaltation sign Taurus, is in the 12th. So this is a watered-down yoga, functioning at perhaps 2/3 strength. Subha Veshi Yoga requires a strong benefic in the 2nd house from the Sun. Here, Mercury is swa in the 11th and free of aspect. This, as much as anything, could be construed as the source of Trump’s ability to craft multi-million-dollar deals. Kala Sarpa Yoga is formed when the Rahu/Ketu axis forms a dividing line through the chart, and all of the planets are on one side or the other of that nodal axis. This yoga is the elephant-in-the-room for Trump’s chart, and is of such magnitude that it deserves an entire analysis all on its own. Kala Sarpa is not discussed in classical shastra. It arises from an oral tradition, probably Tantrik, and is subject to significant differences in interpretation. Some describe Kala Sarpa as a major flaw in a birth chart, a yoga which foretells loss of everything, while others say it bestows the power of a king, assuming the child who possesses it survives. It reminds us of that old saying, Beware of fire and water and Tantriks, for all three have the power to take your life. A “perfect” yoga is when (a) Rahu and Ketu occupy their opposing signs and have no association with any other planet; (b) the sapta grahas, SU-SA, lie (exclusively) within the RA/KE axis and all seven occupy the 150° zone created by the five intervening signs between the lunar nodes; and (c) each of the signs holds at least one of the seven planets. This full-fledged yoga is rarely found. A “partial” yoga is when the seven planets gather exclusively on one side or the other of the RA/KE axis but at least one of the planets is on the RA/KE axis in one or both of the signs occupied by the nodes. A “potential” yoga is when the seven planets fail to gather exclusively within the axis, but all seven planets occupy the seven signs counted exclusively in clockwise or counter-clockwise direction from the RA/KE axis. The latter case of #4 describes Trump’s Kala Sarpa. It narrowly fails to meet the criteria for #3 because his Moon lies just 26 minutes of arc outside the nodal axis. Now that we know Trump has a “potential” Kala Sarpa, or something of a low-grade version of the full-fledged yoga, let’s return to the consideration of effect. Is it a blessing or a curse? Traditional jyotishis have always recognized its capacity to go either way. Kala Sarpa can be a yoga, indicating supreme attainment, but it can also be a dosha, indicating supreme blemish. 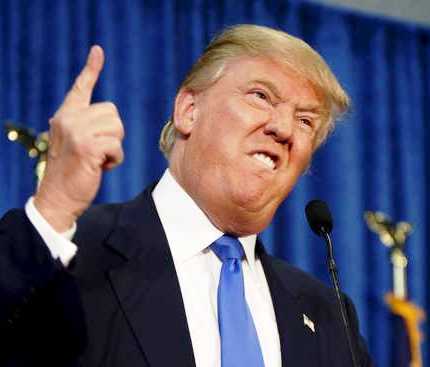 To determine which it is in Trump’s case, we must conduct yoga vichara, an analysis that examines the credits and debits of any individual Kala Sarpa. Does it occur under an eclipse? Yes. 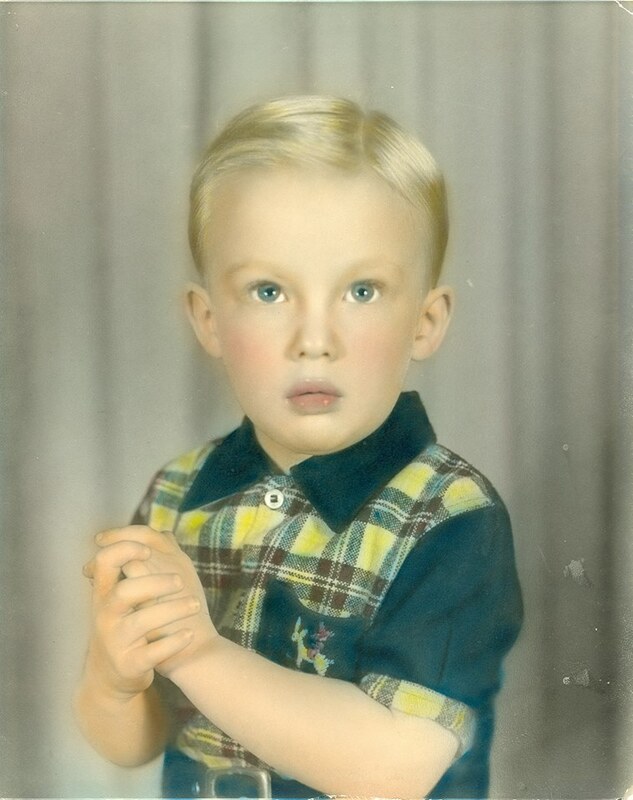 Trump was born less than four hours before a total lunar eclipse. Since he was born in “a troubling time” this blemish deflects our qualitative needle from yoga to dosha. Are the Sun and Moon associated with the nodes? Yes. And because the nodes are the enemies of the luminaries, and vice versa, this is another blemish, further qualifying it as a dosha. Does Jupiter aspect either of the nodes? Yes. Although Rahu is debilitated, the aspect of a strong retrograde Jupiter stabilizes the configuration, giving it yoga status. Do Mars or Saturn aspect the nodes? Yes. Although Saturn is out of play, Mars both aspects and disposits Ketu. Although the angularity of Ketu’s dispositor is a positive factor, its aspect is nonetheless malefic, so we’re obliged to consider this more of a dosha. Is there a stellium through which a transiting node might stir up trouble? No. Are there any exaggerated grahas in the chart? Yes, six of them. The Sun and Moon both have dig bala. The Moon is also full and debilitated. Mercury is swa. Jupiter is retrograde. Rahu is debilitated, Ketu exalted. 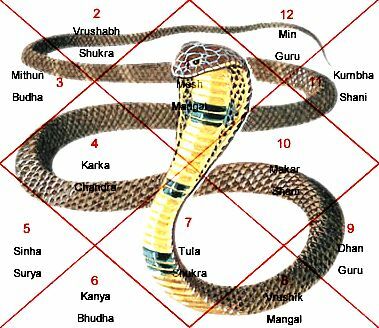 Rahu’s sign dispositor is Venus in the 12th associated with Saturn. Negative. Rahu’s nakshatra dispositor is Mars alone in the ascendant. Positive. Ketu’s sign dispositor is Mars alone in the ascendant. Positive. Ketu’s nakshatra dispositor is swa Mercury alone in the 11th. Very positive. Net effect, a combination of executive power, money-making smarts, and loss of face, therefore, a mixed bag. There’s no easy way to summarize this, but Trump’s Kala Sarpa has qualities of both yoga and dosha. Perhaps critical to the tipping point is his Moon. It’s in a highly exaggerated condition, on the positive side being full and having dig bala, while on the negative side being debilitated and eclipsed. A debilitated Moon is one indication of a disturbed manas. Being eclipsed on the Rahu/Ketu axis aggravates it. Senator John McCain recently admonished Trump to tone down his campaign rhetoric, for fear of “stirring up all the crazies.” But maybe it’s too late, and one of the big ones is already loose. As noted above, Trump’s Moon has just barely escaped the Rahu/Ketu axis, and therefore suggests something of a tipping-point factor in the evolution of his destiny. The Moon is the 12th lord in the 4th house. This calls to mind some B-grade movie in which a chain gang is being transported by bus to work in the fields, but one of the prisoners overpowers the guards and takes control of the bus. Once he’s got his hands on the wheel, however, it’s hardly in Trump’s character to let go. Consider his kendras. Sun and Mars are both kshatriya planets, with a strong bias for command and control. Ketu is Mars-like, which brings more of the same, since all three are considered hot planets. Toss in the Moon, whose only influences are the two kshatriya grahas and the iconoclastic nodal axis, and you have the recipe for a demagogue, an agent provocateur, a rabble-rouser. So where’s all this headed? To anticipate the future, let’s try to understand the past. Trump inherited the family business in 1971, the last quarter of his Venus dasha. Venus primarily gives results for that strong Jupiter in the 2nd. So he got his education and started making money. The Sun and Moon dashas were good for Trump. The Sun forms raja yoga and gives results for its nakshatra dispositor, bhumikaraka Mars, which occupies the ascendant and owns two positive houses, the 4th (real estate) and the 9th. The Moon gives results for its star-lord Mercury, strong in the 11th and owning both of the money houses, 2nd and 11th. Mars dasha was not good. Things went downhill in the early 90s, right to the edge of personal bankruptcy, plus an expensive divorce from Ivana. Mars gives results for star-lord Ketu, which in turn draws fuel from Sun and Mars and Moon, the latter being perhaps the most potent and complex planet in his chart. And the Moon rules the 12th house of loss. Rahu dasha brought him back up again. The node’s association with lagnesh Sun grants it raja yoga status. Rahu finds a public through that full Moon, and it’s the only planet in the chart that receives Jupiter’s aspect. Since April 2014, Trump has been running Rahu-Moon. Little wonder that in this time he’s emerged as a wild (!) card in the campaign for the Republican presidential nominations, making one incendiary comment after another, embarrassing half of his Party to the applause of the other half, refusing to backtrack or apologize for anything, shedding business alliances like a moulting phoenix. Some pundits suggest that Trump has no serious intent to, even if the Republican Party lets him, stay the course until election day on November 8, 2016. They say he’s only doing this to further build his brand. Trump already reckons he’s worth about $10 Billion, half of which is real assets, the other half his (perceived) value of the Trump name. Back to the bhuktis, recall that the Moon is an out-rider, having narrowly escaped the perimeter fence drawn by the nodal axis. While the Moon bhukti runs, Trump is likely to continue his self-designated role of political agitator. But after the Mars bhukti kicks in, from November 2015 onwards, we may well see a change of posture for Trump. 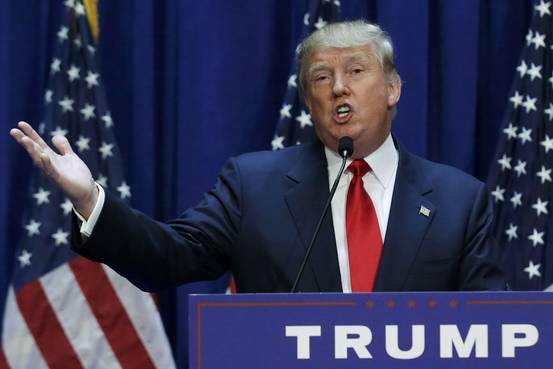 A Trump presidency could be an unmitigated foreign affairs disaster for the USA. Trump is a blow-hard commander-in-chief wannabe. The Sun, Mars and Ketu provide just too much unregulated heat in the Trump persona, and the Moon is a faulty thermostat. His finger on the trigger of an American arsenal would be the equivalent of a teenager with a machinegun blowing his feet off the first time he goes out on the firing range. Meanwhile, Venus, the karaka for diplomacy, and 7th lord Saturn are both in the 12th, which bodes poorly for international relations. (Already, he is Senor Piñata in Mexico.) Between the “I’m-the-greatest” and “you’re-fired” aspects of his personality, there’s barely enough room for a little logic to squeeze in and play devil’s advocate. After Mars bhukti kicks in, Trump will probably see enough writing on the wall to realize that he’d be better off playing “kingmaker” than actually becoming king. Let’s face it, becoming President would kill him. The last three guys were all relatively young when they were sworn in – Clinton 46, Bush 54, Obama 47 – and the White House made them grey-haired men. Trump will be 70 next year. 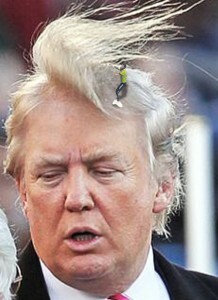 Who wants a President with a grey toupee? But thanks to his energetic rants – basically talking out loud without thinking too much of the consequences – Trump has exposed a deep seam of hate, prejudice and fear among Republicans and, by extension, a sizable swath of the American electorate. Given his surprise showing in the early polls, he’s already increased his brand strength. Now, through a combination of back room deals and public forums, he can still use his influence to shape America’s political future and, quite possibly, feather his own king-size bed in Trump Tower too. His transits suggest a grand exercise in brinkmanship. Saturn will remain in Scorpio up to and including election day, but its presence in the same sign as the Moon spells Sadhe Sati, so there’s likely to be some deflation at the end of the cycle. Transiting Rahu is in Virgo these days, but in February 2016 it will enter Leo. If Trump stays in play that long, it’s likely his rhetoric will become even more inflammatory, but to his political detriment. 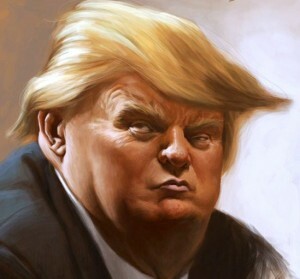 Finally, we have Jupiter currently in his Leo ascendant, where it inflates The Donald’s ego to the size of a Macy’s Parade dirigible, before returning to its natal sign Virgo next year, and he can go back to building his financial empire. In a way, he’s like a wide receiver that’s caught the ball, got a little confused out there in mid-field, and is now running pell-mell for his own end-zone, meanwhile ignoring all his teammates yelling at him to stop and go the other way. But if he can just keep running around out there, making a spectacle of himself for sure, but meanwhile retain control of the ball, he’ll still have the option to hand it off to another player. Then he can step off to the sidelines, saying he knew all along what he was doing, he just wanted to add a little excitement to the game. And people will speak of him forever after in tones of shock and awe, how he almost lost the Super Bowl but, at the last minute, came to his senses and did what was right for the team, the Party and the country. Hail Donald! Long may he prosper! He’s also the author of several non-fiction books. Stellar Astrology offers a compilation of techniques, in-depth celebrity profiles, and analysis of world events. 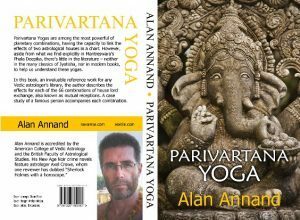 Parivartana Yoga is a reference text for one of the most common yet powerful planetary combinations in jyotish. Mutual Reception is an expanded companion volume for western practitioners, covering the same subject of planetary exchange through the lens of traditional astrology. I really enjoyed this post, thank you for the detailed analysis of this chart! Regarding his potential for wealth I also noticed that Lagnesha (Sun) happens to be the yogi – great for prosperity, and that his Indu Lagna Lord (Sun) is in aspect with the 9th Lord as counted from Chandra Lagna (Moon) while they both have primary strength and from a powerful Raj Yoga from the Chandra Lagna – another powerful indicator of prosperity. Astute observation, Oana! Thank you. So, whereas Moon is exalted in Taurus, both Rahu and Ketu are exalted in Scorpio. Or if you prefer, Moon is debilitated in Scorpio, and Rahu and Ketu are debilitated in Taurus. Since Rahu and Ketu are always opposed, that means that when they occupy Taurus/Scorpio, the one in TA is debilitated and the one in SC is exalted. That doesn’t mean your observation about billionaires is wrong, but you may be attributing their wealth to the wrong planet. If their RA is in TA, that means their KE is in SC, where I consider it exalted. Did you know that a powerful Ketu, aside from its role as mokshakaraka associated with spirituality, can also be a significator of great wealth? Jupiter retrograde in the 2nd house as ruler of the 8th signifies inherited wealth. As it also rules the 5th, gives money from risk taken and gambling. However the 8th is also the house of bankruptcy. Rahu dasa ends on the 13th of November, and he may wake up to find he has been under the illusion of kingship. But Rahu would have also given the results of Jupiter because of the close aspect from Jupiter. Now he moves into Jupiter dasa and then it is back to money etc. Sun with close Rahu would also mean that he would lie very convincinly and even believe it himself. Excellent observations, Nimmi. Thank you!